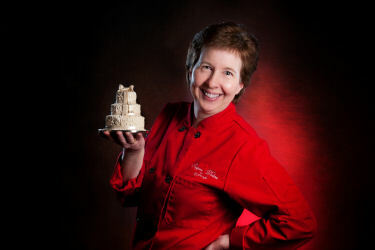 Jennifer Dontz is an ICES approved instructor and has over 35 years of experience in the cake baking industry. At the age of 13, Jennifer began to teach herself how to bake and decorate cakes. This love for cake decorating inspired Jennifer to open her own cake business “Sugar Delites.” After several successful years of baking cakes, Jennifer decided to share her abilities by teaching various techniques through classes and DVD’s. Jennifer has taught classes worldwide, which generally focus on sugar flowers. Her floral background has given her the ability to create the most realistic flowers possible. Through teaching sugar flowers, this is how the Sugar Delites online store was born. Jennifer knew that students would like to own the actual products that she was teaching with. Sugar Delites has since grown into a one stop specialty shop for sugar artists from all over the world with continued product innovation and additions. Jennifer's work has been featured in numerous magazines, such as "Here Comes The Cake," "Northern Michigan Wedding and Event," "Women's Lifestyle," and "The Knot – Michigan." Jennifer was also featured on the cover of ICES monthly publication. In 2007, Jennifer was chosen to be a cake designer for the nationally published “John Henry Floral Book.” She also designed the cakes for the 2009 “BloomNet” book. BloomNet is an affiliate of 1-800 Flowers. Jennifer has made two appearances on TLC’s “Ultimate Cake Off,” helping her teammates to one victory.